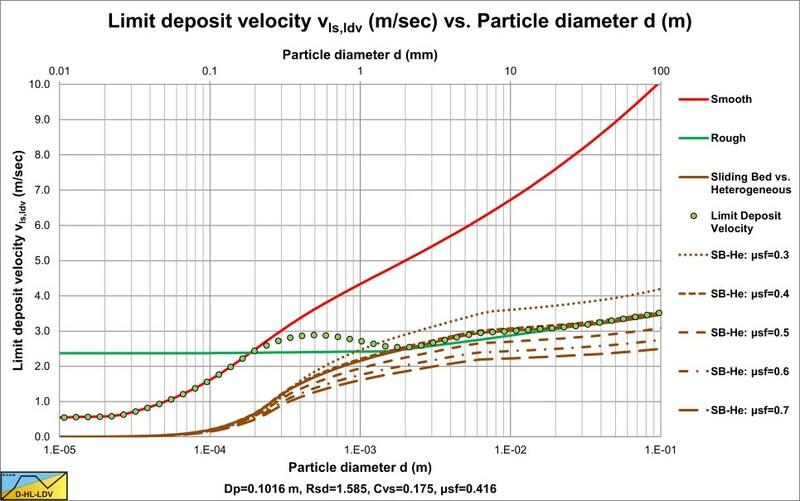 Very small particles, the LDV is based on a sliding bed in the viscous sub-layer (the red curve, left part). Small particles, the LDV is based on the potential energy required to keep the particles in suspension (the red curve). Medium particles, a transition region between small and large particles. Large particles, the LDV is based on a limiting sliding bed in turbulent flow (the green curve left part). 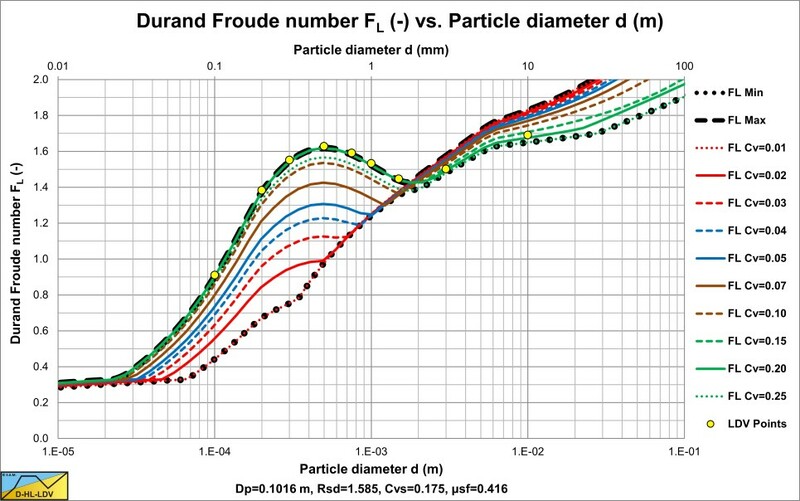 Very large particles (d/Dp>0.015), the LDV is based on increasing porosity in a sliding bed, named sliding flow (the green curve right part). The LDV has a lower limit based on the transition line speed between the sliding bed regime and the heterogeneous flow regime. This lower limit depends on the sliding friction coefficient (the brown curves). Since in dredging the concentration is not a constant, the Limit Deposit Velocity curves are plotted in the following graph for concentrations of 1% up to 25%. By doing this a lower and an upper limit can be defined for the Limit Deposit Velocity. Knowing the Limit Deposit Velocity, the slip factor can be constructed and based on the slip factor, the bed fraction or bed height. Also the spatial volumetric concentration Cvs based on a constant delivered volumetric concentration Cvt is shown.